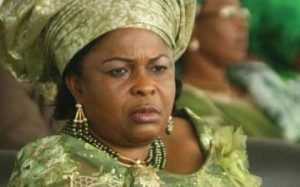 A Federal High Court in Abuja has fixed November 16 to hear the N2 billion Fundamental Rights suit brought against the Economic and Financial Crimes Commission, EFCC, by the wife of the former president, Mrs Patience Jonathan. Mrs Jonathan filed the lawsuit in June to challenge her alleged incessant harassment by the anti-graft commission. At the proceedings, Mr Ifedayo Adedipe (SAN) announced to the court of his readiness to move his client’s application. The judge, Justice John Tsoho, however, refused to entertain the suit on the grounds that the respondent was not represented in court. Mrs Jonathan is seeking an order for general damages and compensation in the sum of N2billion. She claimed that the amount would serve as compensation for the violation of her fundamental rights by the commission. The former first lady is also seeking a declaration that her incessant harassments by the EFCC through negative media publications aimed at degrading her person as corrupt had sufficiently violated her rights. The applicant claimed that the commission had without her invitation and interrogation approached a court to freeze those accounts. The anti-graft agency also seized three other properties in Abuja allegedly owned by the applicant. Mrs Jonathan first came under EFCC’s searchlight in May 2016 when the commission arrested a former Special Adviser to the President on Domestic Affairs, Waripamowei Dudafa.